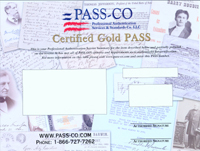 The PASS-CO ˜PASS system is leading the industry forward. Our detailed process of authentication and grading has been developed to ensure our ability to deliver the finest service of its kind. Upon successful authentication by our experts, your item receives its own individual PASSProfessional Authentication Service Summary]. This signifies that your collectible has undergone a detailed process of authentication and grading (when this selected option is chosen) by our experts and has been deemed genuine. Unlike traditional COAs, the PASS-CO PASS carries with it a monetary guarantee up to $5,000.Â And your PASS-CO PASS, with our exclusive variety of security features, provides the most secure authentication summary in the industry. You now have a greater level of confidence with PASS-CO certified items. Your authentic collectible and its accompanying PASS are fully traceable within our exclusive on-line tracking system. This further assures you, or any potential future buyer, that your material has been authenticated by the industry leaders. Look no further. Accept no substitutes. What is a PASS-CO PASS ? 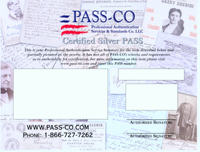 First and foremost, the PASS-CO PASS is your Professional Authentication Service Summary. The issuance of this summary indicates that a review of your item has been conducted by our team of experts who have concluded that the item referred to in the PASS meets all criteria necessary to be determined authentic. 1) Authentication of your item. 2) A unique serial number within our database and on our website allowing for instant online verification that we have issued a Professional Authentication Service Summary for the item. 3) A secure document incorporating modern anti-counterfeiting features along with state-of-the-art micro-taggant technology deterring fraud. 4) Peace of Mind in knowing industry leading experts have authenticated, and graded your item. Why do I need a PASS-CO PASS? What are the benefits? The Benefits of the PASS-CO PASS. The issuance of a PASS represents the completion of a professional authentication of your collectible which has been determined by PASS-CO to be genuine. Our authentication delivers an unparalleled level of confidence to you, or any future prospective buyer who may comfortably make a purchase knowing the item has PASSED the most stringent of authentication standards. Your ownership experience will be a more pleasant and an exciting one knowing that an independent third party team of experienced industry veterans have authenticated your item. No more doubts about that 'bargain' which may have seemed suspiciously cheap. You'll feel better owning the item and have a high level of confidence when the time comes to offer it for re-sale. And rest assured, the PASS-CO PASS may well indeed provide an added level of value to a prospective buyer or auction house, thereby helping to facilitate a sale of the item at a higher price than a similar item not accompanied by a PASS-CO PASS. In some cases, the relatively modest cost for our services may significantly increase the value of your item. I currently have a dealer Certificate of Authenticity. Why do I need yours? In the last decade, large amounts of COAs and LOAs have been issued by individuals with virtually no experience in the trade. Many of these authenticators had fraudulent credentials and dumped large numbers of worthless certificates along with their corresponding items into the marketplace. Many of these were based upon dubious relationships with forgers, pseudo-dealers and others of less than well-repute. While it is comforting to know that the FBI and other law enforcement agencies have taken steps to halt some of this activity, many fraudulent authentication certificates circulate freely on the internet. If you are currently uncomfortable with any of your current COs or LOs submit your item to us for a full PASS-CO review. Many qualified dealer statements of authenticity are indeed quite valid. Those that have been issued by dealers with many years of experience are often acceptable. Indeed, we consider many of these dealers as valued colleagues and trusted friends within the trade. Perhaps this is adequate for your needs. However, if you would like further assurance of your item's authenticity PASS-CO can help. To be absolutely confident, get the PASS-CO PASS.